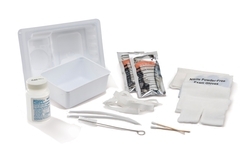 Covidien Tracheostomy Care Tray w/ Saline. Standard Trach Care Tray: bottle of sterile saline, (2) SAFESKIN PURPLE NITRILE gloves, trach sponge, (2) packs Hydrogen Peroxide, drape. © Covidien. All rights reserved.